One way the shop hopes to keep the lights on, is through bike restoration. FCW receives bike donations through a variety of sources (a big shout out is due to the Mid Ohio Food Bank) and will select certain bikes to restore and sell. 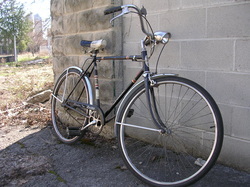 Bike restoration will take place on Wednesday mornings from 9AM to 12noon. This will be a good time for volunteers to gain shop credit and learn advanced bike maintenance skills.